Foreign tourists in Japan often yearn to get "off the beaten track" but struggle to make a meaningful selection of where to go to maximize their limited time. Kyushu can be a great choice and Usuki, on Oita's east coast, about a half an hour's drive or train ride south of the city of Oita, offers a chance to explore a feudal castle town as well as Buddhist relics so old that their origins are lost in time. Built on a tall, rocky outcrop in Usuki Bay called Niyujima and completed in 1562, this castle must have cut an imposing figure in its heyday. It was the seat of Daimyo Otomo Sorin, who famously converted to Christianity around the same time. With the island's steep cliffs topped by castle walls, it was readily defended from enemy attack and is even said to be the first castle to use cannons in its defense in 1578. Alas, the castle's occupants were starved out in a siege that same year. Over the next 300 years, the Inaba family were lords of the castle. Then, at the beginning of the Meiji Period the castle itself was dismantled on the orders of the Imperial government, as so many castles were during that time period. Beginning around the same time, the shallow bay around Niyujima was gradually filled in, leaving the castle fortifications atop the hill but now surrounded by land, no longer on an island. Even without the donjon castle keep itself, the remaining stone walls and reconstructed gates and guard towers make this a fascinating spot to visit. On the relatively gentle climb to the top of the hill it's easy to imagine the fortifications and defensive techniques employed. There are some foundations remaining for the donjon and outbuildings as well as a number of helpful signs in English. A massive dry moat separates the outer castle grounds from the honmaru site of the main castle keep. From the honmaru, visitors can enjoy a panoramic view that includes the bay and a modern shipyard, yet it is easy to see what a truly strategic position the 16th century castle occupied. Just a few blocks straight out the castle gate brings you to the home of the castle's Edo Period lords, the Inaba family. Sitting amid nearly an acre of traditional gardens, only part of the original palatial villa remains, but it is enough to provide a glimpse of the samurai lifestyle. A warehouse in the garden also doubles as a souvenir shop. (Open daily, 9 a.m. to 5 p.m.; 320 yen). 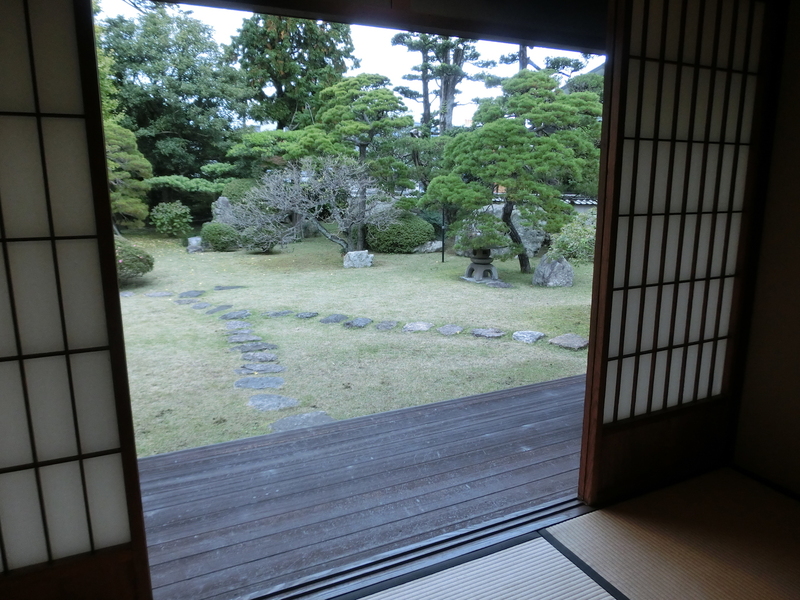 Not far from Usuki Station is another Edo era samurai residence, that of the Marumo family. This house is slightly less opulent, but contains displays and relics of the more mundane aspects of daily life including cooking and bathing. (Tuesday through Sunday, 9 a.m. to 5 p.m.; free admission). In Japanese, castle towns are usually referred to as jokamachi (the town below the castle); at Usuki that is literally so. South of the Inaba Villa and southwest of the castle gates are the remnants of the old samurai quarters. Known as Nioza, the district boasts a number of picturesque cobblestone laneways lined with traditional walls broken at intervals by gateways to temples and residential compounds, many with English signs providing information on the original samurai occupants. Originally the "gateway" to the town, the narrow, crooked streets were defensive. It is said the multitude of temples served the same purpose. Haccho Oji, the traditional shopping street of the district, is now a combination of galleries and specialty shops together with shops catering to the daily needs of residents. The eclecticism makes it well worth exploring. There are so many temples in this area that it is hardly worth singling out any one of them, but just on the southwest outskirts of the district, not far from the river, sits Ryugenji, which has a particularly unique 19th century three-story pagoda. 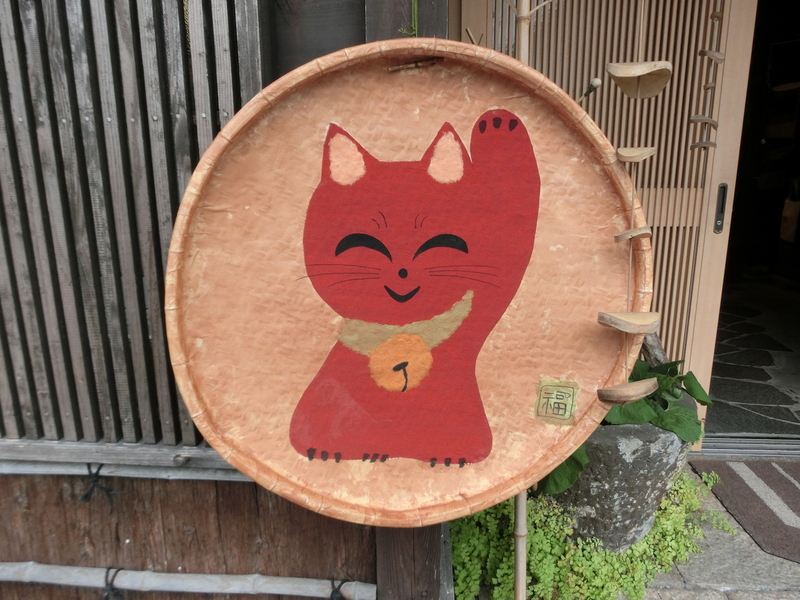 As you walk the streets of Usuki, you may notice figures of red cats. These lucky cats are a phenomenon of the early Meiji period, when local merchants began to use them instead of the traditional white "lucky cats" to call fortune. The red cats became so popular that Fukura Tenmangu, a local shrine just up the road from Ryugenji, began to offer amulets depicting them. There is now a children's festival around Golden Week every year as well. Japanese history buffs may be familiar with the story of William Adams, the English pilot of a crippled Dutch trading vessel, De Liefde, that drifted into Usuki Bay in April, 1600. Others may be more familiar with the character of John Blackthorne or "Anjin-san" in James Clavell's 1975 novel, "Shogun" and the subsequent TV mini-series, which was loosely based on Adams. The survivors on the shipwrecked De Liefde were held in Usuki for some time while Tokugawa Ieyasu, then in the final stages of his rise to Shogun, decided their fate. It may be fun to imagine Adams strolling these streets, but in fact, he was never allowed his freedom while here. Instead, imagine the gossips in the temple yards spreading news of the arrival of strange Westerners. Just six kilometers west of Usuki is the Usuki Sekibutsu (stone Buddha) Park. There is bus service from Usuki Station, where rent-free bicycles are also available, if you're feeling particularly adventurous. Predominately carved into steep hillsides of volcanic ash flow from nearby Mt Aso, there is no written record of the history of these sekibutsu. 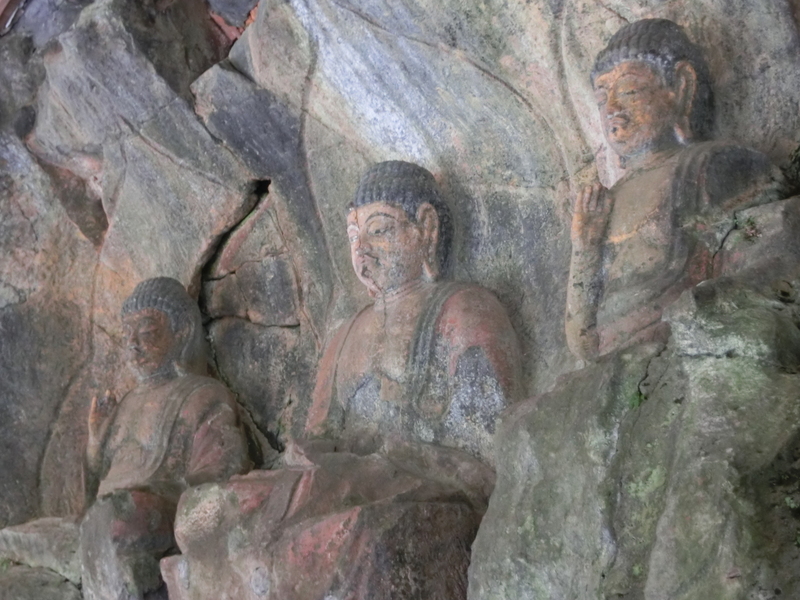 It is believed the oldest were begun more than a 1,000 years ago, when esoteric Buddhism predominated and such acts as carving Buddhist images played a role in meditative worship. The majority of the images are carved in four main clusters and it would seem activity here stopped about 800 years ago. Sekibutsu can be found in many places across Oita, possibly because the geological legacy of Mt Aso provided the necessary raw material to allow this trademark activity of esoteric Buddhism to thrive here. But Usuki is home to one of the largest concentrations of the statues, which are also said to be of particularly high quality. Substantial restoration and preservation work undertaken about 30 years ago, together with walkways and stairs, make it easy to access the statues without endangering them. If you're on bicycle, take the time to ride around the valley floor as well. In the summer, the flooded lotus fields are especially pretty. On the other side of the valley from the sekibutsu is Mangetsu Temple, famous for the half-buried stone Nio statues that guard the entrance. Usuki could easily be explored as a long day trip from Beppu or Oita, but if you have the time to stay overnight you can also enjoy the local cuisine, including fugu (blowfish) sushi -- if you dare! 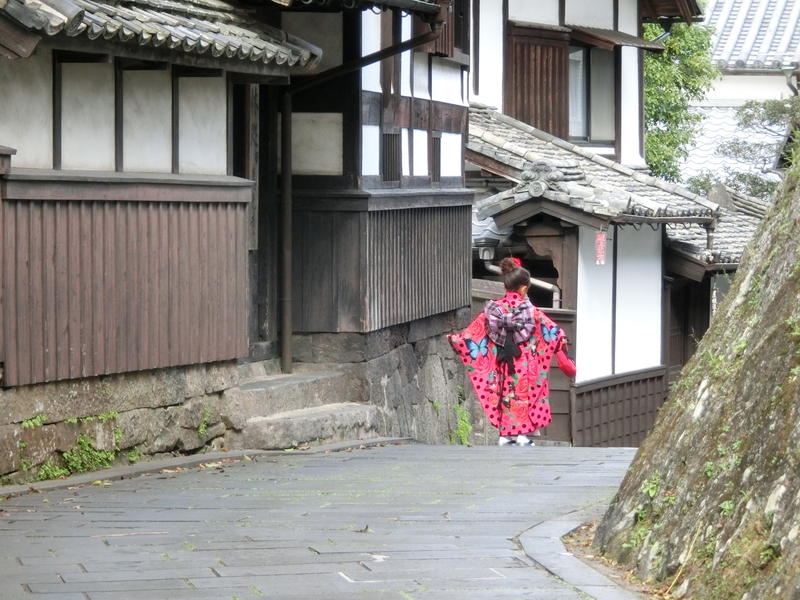 Vicki L Beyer, a regular Japan Today contributor, is a freelance travel writer who also blogs about traveling in Japan. See her blog at jigsaw-japan.com. Sounds cool and worth a visit. Loving the castle and its story. I'd recommend a stop at the traditional shochu brewery in the historic Niiza district and a caramel-lile soy sauce topped ice cream from one miso and soy maker's shops as well. If you're around in winter, the fugu is the best around and amazing. Fascinating. Thank you for your hard work Vicki.